Does Amla Powder for White Hair Work? Everyone desires beautiful hair and premature whitening or graying of hair is not welcomed. When white hair appears early, you may lose your confidence as it makes you feel older in comparison to your real age. Early graying of hair can occur due to multiple reasons such as stress, heredity, lack of sleep, illness, improper diet, dandruff, unclean scalp, excessive consumption of alcohol etc. You can treat white hair with some herbal remedies that are easy to use and give back your lustrous black hair. Amla tops the list of natural herbal remedies to treat premature whitening of hair. It is an effective ingredient that is utilized in most of the home treatments that are used to reverse the premature whitening of hair. Amla has plenty of anti-oxidants, which help in fighting against the free radicals that cause damage to the follicles of hair. Apart from damaging the hair follicles, these free radicals also damage the melanocytes, which are the cells that produce black pigment in hair. Damaged melanocytes do not produce the black pigment melanin, gradually turning your hair gray or white. However, this process of early graying of hair can be reversed by using some home remedies that have amla in them. A combination of almond oil and amla is considered to be very effective in treating the problem of gray hair. Massage of almond oil and amla will restore the natural black color of your hair and also promote healthy growth of hair. How to use amla powder for white hair? Chop amla into tiny pieces. Keep them in the sunlight to dry. Dry them till no moisture is left in them. Make a powder and store in an airtight jar. Heat 1 cup almond oil in a saucepan and add amla powder. Switch off the heat when the amla powder turns brown and mix the contents. Allow the almond oil to cool. When you want to massage your hair, then take the mixture of amla almond oil according to the length of your hair and apply it on your hair. Massage it on the scalp with your fingers. Store the remaining oil in a bottle for future use. 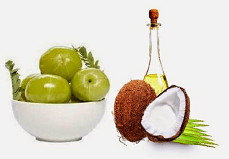 Coconut oil and amla has demonstrated excellent results in treating premature graying of hair. Coconut oil nourishes your scalp deeply and protects hair follicles. Whitening of hair generally occurs when the efficiency of hair follicles, which play a vital role in hair color, is lost. However, coconut oil and amla repairs and nourishes hair follicles and helps in preventing further whitening of hair. How to use amla powder for white hair? Prepare the amla powder as mentioned in the previous step. Heat coconut oil in a saucepan. Add amla powder to the oil. Switch off the heat when the amla powder turns brown. Let the oil cool. Stir the mixture to blend them. Apply this mixture in your scalp and hair and massage for some time. Store the remaining oil in a bottle for future use. Amla has lots of vitamin C; it reduces deficiency of melanin and removes dead cells from the scalp. Lemon has anti-fungal, antioxidant and antibacterial properties that help in curing hair fall, graying of hair and damaged hair problems. Mix juice of one lemon, 2 tsp of water and 4 tsp of amla powder. Mix well to make a paste. Leave for an hour. Apply this amla paste in your hair roots and scalp and leave for around 20-25 minutes. Then wash using clean water. Don’t use soap and shampoo when using this paste. The paste shouldn’t go in your eyes while washing your hair. Use the paste every 4th day. You may use shampoo and oil on your hair on other days except on day of applying the paste. Use herbal oil and shampoos. You can use pure amla oil as hair oil. How to use amla powder for white hair? 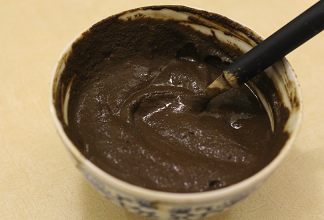 Henna is an excellent natural herbal remedy that is used to color white hair. You can make it easily at home. 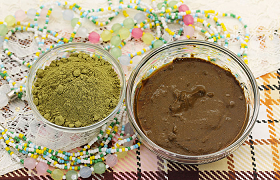 Mix some amla powder and henna powder (organic) in water and form a paste. Leave the paste for around 2 hours. Apply it to your hair and scalp. Let it remain on your hair for 1-2 hours and then wash with water. Amla and shikakai has been utilized traditionally by Ayurveda to treat hair problems since thousands of years. Shikakai is also an effective treatment for graying of hair. 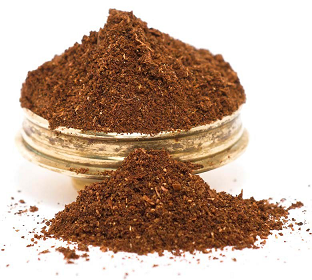 Take 12-16 seeds of shikakai and grind them to make a very fine powder. 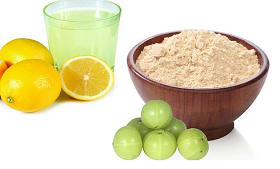 Add this powder along with 3 tbsp of amla powder in a glass of water. Let them soak for the night. Strain the water and use this water to wash your scalp and hair. It acts as a natural shampoo. On using it regularly for a few weeks, you will get shiny, black and long hair. Mix some juice of lime to 1 tbsp of pulp of amla. Do massage with this mixture on your scalp and leave overnight. Wash your hair in the morning using a shampoo. Repeat twice a week. 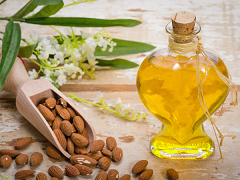 Take equal quantities of almond oil and amla juice according to the length of your hair and mix. Apply the mixture into the scalp and massage for a couple of minutes. Leave it for the night. Wash next morning with a shampoo. You can eat 1-2 fresh amla or drink amla juice that is prepared fresh. Cut small pieces of fresh amla, sprinkle black pepper and salt. You can also drink 1-2 tbsp of amla juice (fresh) regularly. The best time to consume amla is either in the evening or morning. Henna not only darkens your hair but also provides strength to your hair. To make a henna pack, make a paste of henna leaves, add 3 tbsp of amla powder, 1 tbsp of coffee powder and some plain yogurt. Apply this 2-3 times per week to your hair for 4 weeks and see the difference. It not only darkens your hair but also makes your hair soft and smooth. Boil 2 tsp of black tea in 1 cup of water. Add 1 tsp of salt. Let it cool. Apply this to your hair. Leave it for 20 minutes. Wash it with a mild shampoo. Repeat at least two times a week. Boil ½ cup of both sage and rosemary separately in 2 cups of water. Leave for 2 hours, and then mix both of them. Wash your hair with a shampoo and use the mixture as a hair rinse. Boil curry leaves; now add coconut oil until the curry leaves are charred. Massage it in your hair. Leave for 30-40 minutes. Wash your hair. Massage juice of onion on your scalp for getting rid of gray hair. Use it each night before you go to bed and let it remain in your hair overnight. Drink one glass of freshly prepared carrot juice every morning. It is an excellent remedy to treat white hair.